Arkansas, what a wonderful state! Many people take long vacations, go to school, or permanently relocate to The Natural State. National Dispatch can help you with any of these adventures by transporting your vehicle from anywhere in the United States to Arkansas. Visit Arkansas. This not only saves you time, but it can save you money. If you are a college student, this will provide you with the ability to explore all of the great amenities that Arkansas has to offer. Below, you will find a list of a few of the auto shipping services that we offer. This is the most popular auto shipping service that we offer. In Open Auto Transport, your vehicle will be loaded onto a car carrier, capable of hauling up to nine vehicles. The car carrier is open-air, so your vehicle will be exposed to road elements and changing weather conditions. However, this shipping method is a quick and reliable way to get your car to Arkansas. This auto shipping service is similar service to Open Auto Transport. However, instead of being in an open-air carrier, your vehicle will be placed in an enclosed carrier. Enclosed Auto Transport provides additional protection for your vehicle during transit. This is highly recommended for people who are shipping high-valued cars, such as classic, luxury, exotic, or sport models. This auto shipping service is the most convenient for our customers. With Door-to-Door Shipping, your vehicle will be picked up directly from your home or business and be taken to its destination. This service allows you the time to focus on other more important aspects of a move. Leave the shipment of your vehicle to us. Once your car arrives safely, you might want to explore your new surroundings. Below is a list of places that we feel are worthy of visiting. If you visit Gurdon, you may come across a light in the woods near the railroad tracks. Local legends say that the eerie blue, sometimes orange, light is that of a railroad worker’s lantern that passed away. People who see the light say that it is too far from the highway to be a car’s headlight. While the exact explanation is still uncertain, the television show, Unsolved Mysteries, suggests that it may be due to a phenomenon known as the piezoelectric effect. The piezoelectric effect happens when electricity is generated by materials that become bent or squeezed. Located in Murfreesboro, Crater of Diamonds is the only diamond mine in the world where you can keep your findings. Before it became a state park, the crater of diamonds was owned as farming land by John Huddleston. He found the first few diamonds in 1906. After that, the land was passed between owners until the state bought the land in the 1970s. Today, there is an average of two or more diamonds found at the park each day. Everyone is welcome to mine and keep what they find, making this a fun adventure. 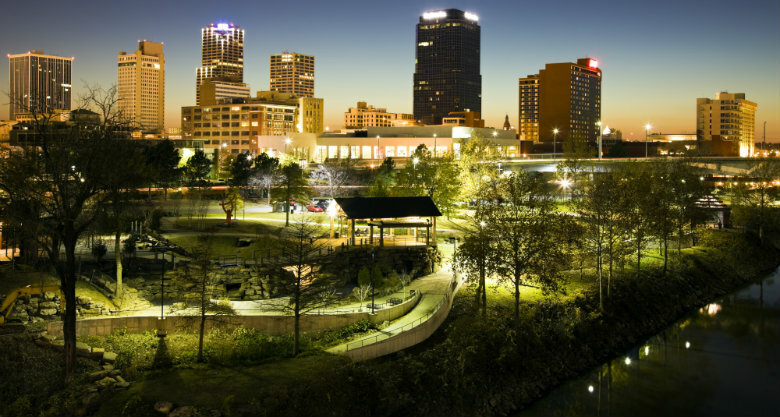 Little Rock is home to one of the nation’s best science museums. In fact, the Museum of Discovery was featured on The Tonight Show Starring Jimmy Fallon. The Museum of Discovery has more than 90 hands-on exhibits for all-ages to enjoy. You can learn about the body, paleontology, tornadoes, and many more scientific and mathematical discoveries. The mission of the museum is to create a passion for science, technology, engineering, arts, and math in people in a unique and interactive way. The admission price of the museum is inexpensive, so this is a budget-friendly family outing. Located in Hot Springs, the Garvan Woodland Gardens provide a scenic and tranquil place to visit. The gardens are located at the University of Arkansas in the Mountains. The mission of the gardens is to enhance and preserve this unique part of the Ouachita environment by providing people with a place to learn and research. It will take a minimum of one hour to enjoy the gardens, but more time is recommended. During your stay, you will see waterfalls, ponds, streams, bridges, overlooks, and of course, many gardens. Admission into the gardens is $15 for adults and $5 for children. You can even bring your dog to the gardens if you are willing to pay an additional fee and follow the guidelines of the gardens. Service dogs are allowed admission for free. During lunch, head on over to the Chipmunk Cafe for a delicious meal. Learn more about Hot Springs. Turpentine Creek Wildlife Refuge is located in Eureka Springs and is one of the largest facilities, in the world, that is open to the public. The goal of the refuge is to save exotic cats and other animals, from horrible circumstances. Currently the refuge is home to tigers, lions, ligers, leopards, cougars, servals, bobcats, bears and a couple of monkeys. The refuge has gained such a great reputation, that there is a waiting list for animals to be sent to the facility. While this is great, it prevents some animals from being able to be sent to the refuge for care. This is where donations come into play. Donations and admission also help take care of the current animals by providing the staff with the supplies needed to clean and feed the animals daily. If you want a longer stay at the refuge, you can camp or stay in several different lodging environments. During the day, you can go on one of the habitat tours that is led by an intern. On the tour, you will be able to watch the cats play and act just as they would in the wild. Learn more about Eureka Springs. Are you in need of auto shipping services to or from Arkansas? Contact National Dispatch today for a free, instant auto shipping quote using our quote calculator. No personal information is required. If you prefer to speak with a representative by phone, call us at 800-321-2051.